This blog was written by Athentikos’ own David Lee, who has been a key player in the development and execution of our Summer 2017 IAA camps at Front Porch Ministry. As I reflect on the first three domestic I Am Art events and we head into our art show, I am very grateful to be a part of what is happening in Nashville. Front Porch Ministry has been a blessing to partner with and the work that they are doing cannot be understated. The community they serve has a population of kids that have great potential. Thom and Michele are truly investing into these kids with love. Watching the family operate and the relationships they have with the kids there is a beautiful thing. Their work is truly a work of compassion. The projects that we have put on so far have brought together local artists and inner city kids. This is opening channels of communication from the far reaches of the county all the way to downtown. 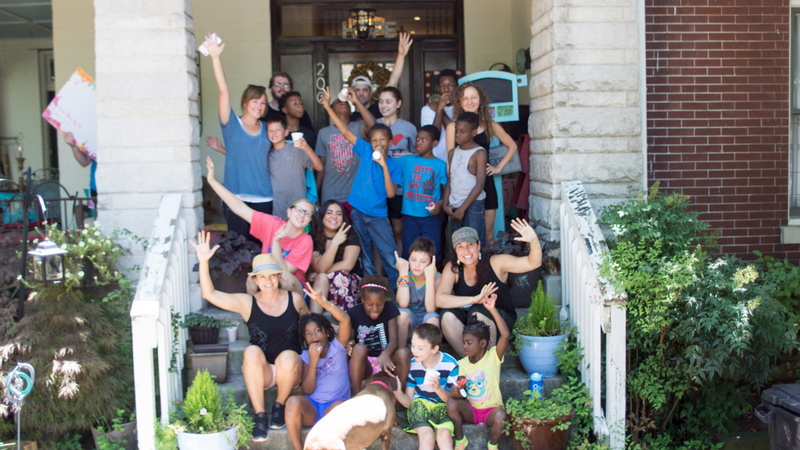 The stories I was originally told about the neighborhood we have been working in were somber and detailed a hardened community but as I met more and more people that lived there I saw hope and grace that was being cultivated around the literal front porch of Thom and Michele’s house. 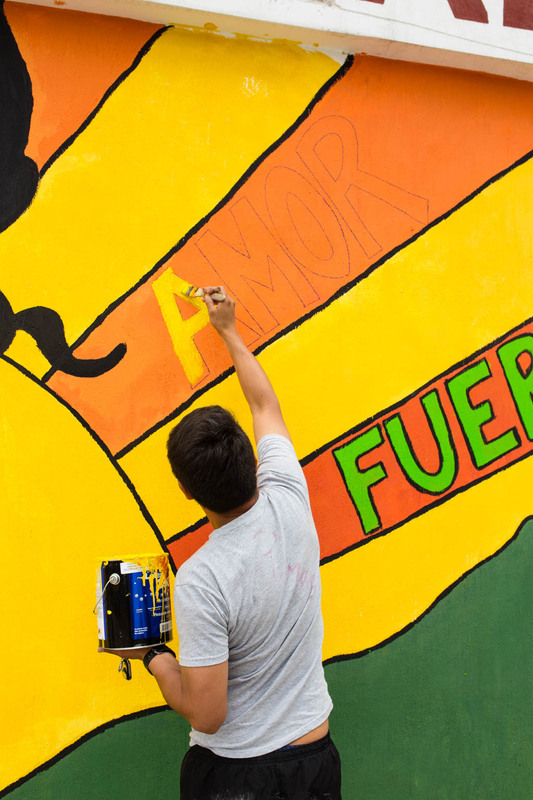 The mural was our first splash into this community and that is exactly what it became. 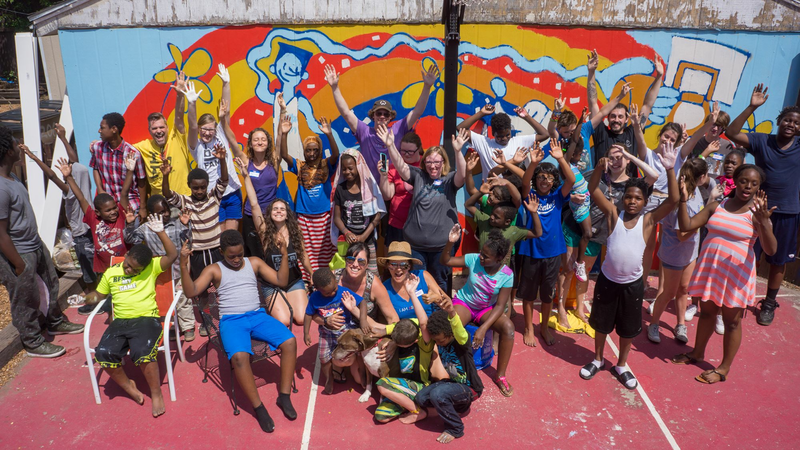 We played water games and painted our way through the heat of Nashville’s June until we completed a 24 foot long mural! 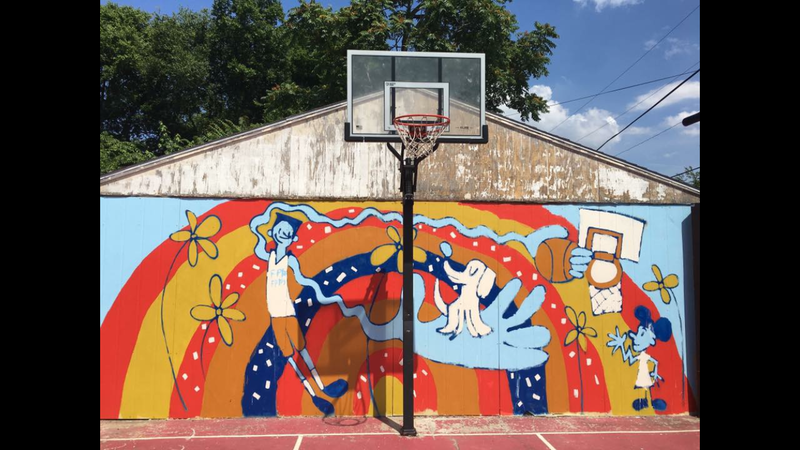 We cannot thank local artist Ellie Caudill enough for the time and talent that she invested in the lives of these children and in the beauty of this neighborhood. 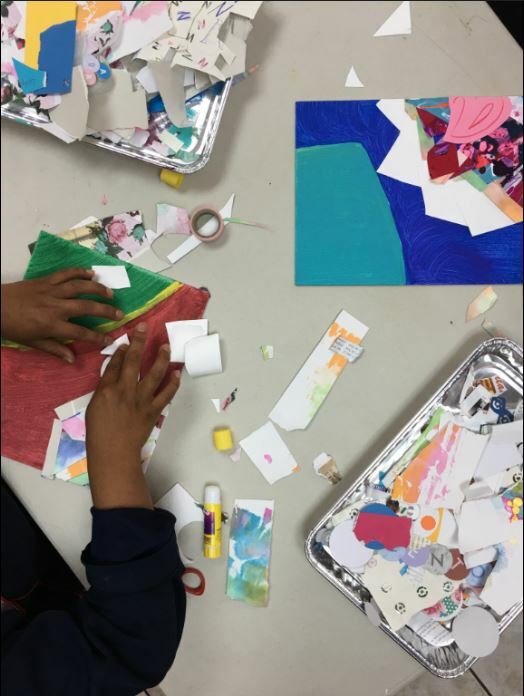 Our first camp was with a smaller group and consisted of an abstract self portrait workshop led by other local artists, Lauren Dunn and our own Amelia Moore. We were able to focus deeply into individual friendships and develop long lasting relationships. I think that these projects have truly made an impact in the children’s lives and we look forward to displaying these works at the end of the summer. The conversations that we have around creating these art pieces always explore the theme of how we handle conflict in our lives. Having these conversations in Guatemala for the last three years presented an interesting juxtaposition to the inner city Nashville neighborhood, however, the result remains the same. Grace presents us with the path to ultimately resolve the conflict in our lives and this journey can be done with creativity and community! We just completed our last Nashville I Am Art camp that ran from July 20-22 and we ask that you pray for our Art Show tomorrow on July 28th. The art show is such a pivotal part of our camps as it brings our young artists a sense of pride in their gifts from God. It is the perfect ending to this beautiful story of I AM ART. 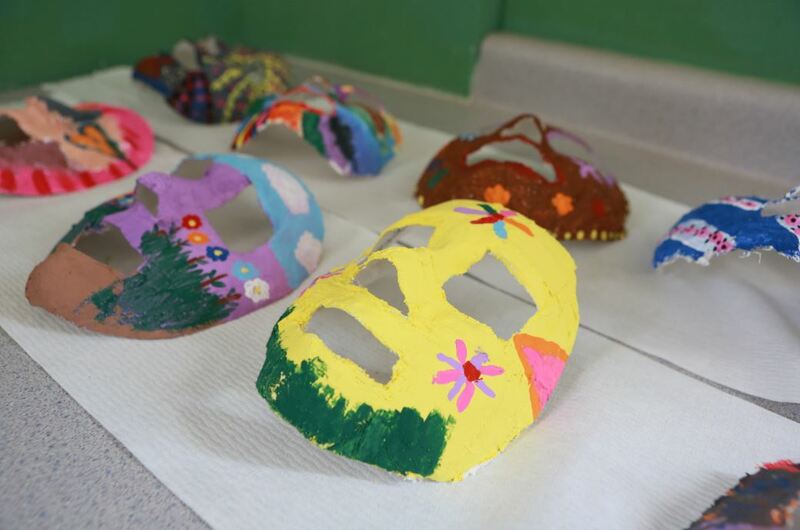 The following blog was written by one of Athentikos’s volunteers and workshop leaders, Kati Korosuo. Going to Guatemala had been hunting me for about 13 years, until last summer (2016) I finally made it there. 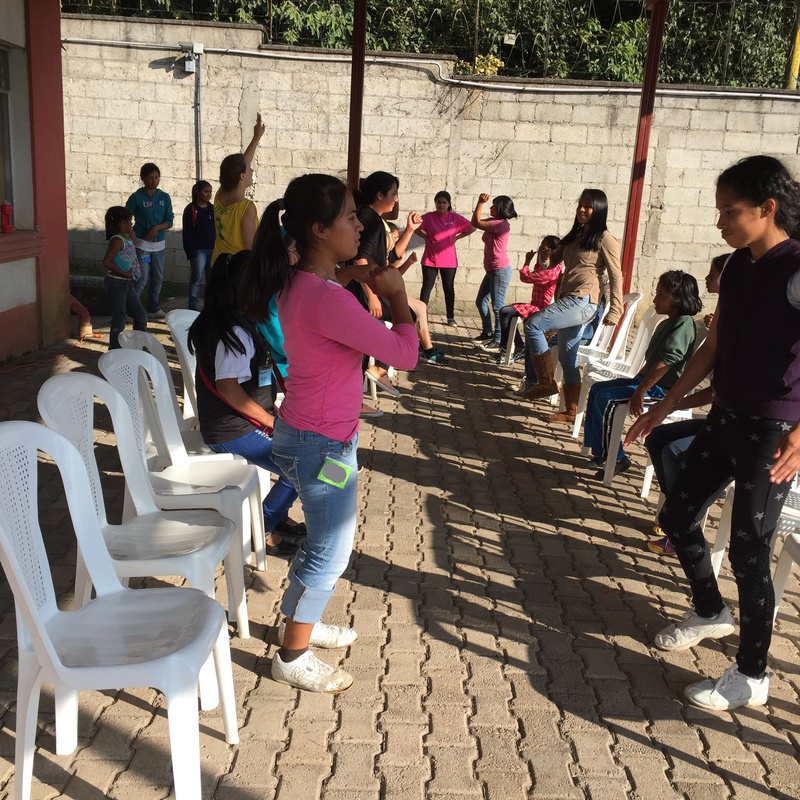 I spent five weeks in the country teaching Dances to a Beat (DTB), a dance technique I’ve developed myself, to a vast variety of different groups: from teenagers in an elite dance school, to dancers in a wheelchair dance company, to kids in the ghetto of La Limonada. DTB is a technique based on improvisation, repetition and rhythm. It deals a lot with seeing oneself as part of a bigger, meaningful picture and understanding one’s crucial importance there. DTB is a technique where the aim is to not just to accept one’s own movements, history, and personality, but to appreciate and enjoy them. It ultimately is a technique to celebrate the uniqueness in each of us! I was very happy to be able to share DTB at Athentikos’s I AM ART camp with Vidas Plenas in La Limonada. Athentikos’ values about authenticity and transparency resonated strongly in me, and I had a good feeling about this collaboration. In La Limonada the extreme poverty, criminality and violence become a concrete reality that was, literally and metaphorically, thousands of miles away from my everyday life in Finland. Teaching the kids there had an impact on me, that is difficult to put in words. It changed something in my heart forever. After my experience that summer, the culture shock returning back to Finland hit really bad. It was frustrating and difficult to become interested in all those meaningless things that we, in a western welfare state, have the luxury to become interested in and spend our lives on. And this shock didn’t ease out until I had decided to go back to Guatemala. I wanted to continue working with Athentikos, and ended up spending two months in the country planning and executing an Artist in Residence pilot program that Athentikos plans to launch in 2018. 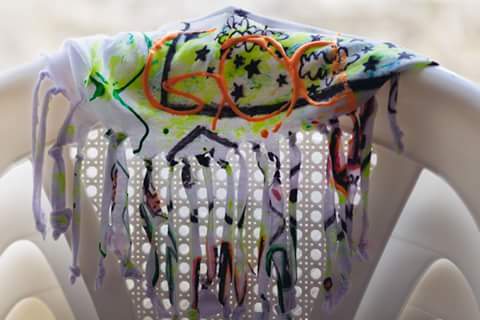 This residency included two IAA camps and in-between working with Athentikos’s established partner organizations plus creating new connections with the local art scene there. I realized that coming back to Guate to continue the work I had started there was like a reconciliation: an action that had to be followed after that something that had started to stir in my heart. 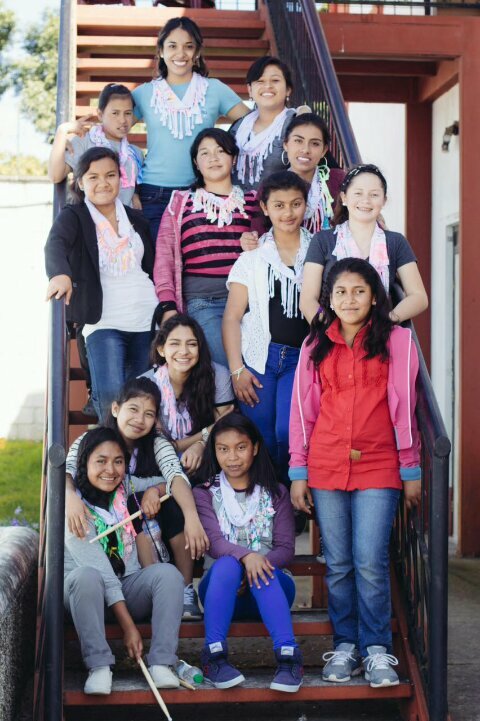 My third I AM ART camp in Guatemala was held at Oasis, a home for sexually abused girls, where I had visited twice before. The camp didn’t start off so well, and new girls kept coming into my workshop in the middle of the week. They were super shy and reluctant teenagers, who seemed to resist everything I suggested. I quietly acknowledged that this week wouldn’t be so great now, however, I still wanted to do my best. And on the third day things changed. The girls started to open up and they would end up telling me things I would have never imagined. They shared with the group and they shared with me privately. They wrote letters. They told me how important this week was for them and how they had learned so much about dance and self-worth, how this group was like a family to them and how they wished this week would never end. The last days there entailed more hugs and tears than many months would. Spending longer time in the country gave me the opportunity to understand the Guatemalan culture better, the both wonderful and challenging sides of it, as well as to connect on a deeper level with the locals. There was time to form real friendships and to see the kids in different moods, having good days, having struggles, having graduations. Returning back to places, seeing the kids again outside the camp setting also made me to understand that I’m just a visitor in their lives. I will be gone, and they will be just fine. However, after my last IAA Camp at Oasis, this perspective was challenged once more as I realized that the experiences we had and lessons we taught will stay with them forever. One night at the camp the director of Oasis told our team some statistics and facts about the sexual violence in Guatemala and generally about some of the girls’ cases. I had not prepared for such hard facts and intense stories. This reality was very difficult to take in. In the beginning I had surely wondered about what kind of a story each girl there had (especially when some of them went to court and hearings during the week), but later, every time a story would get a face and a name, I crashed. I then felt that it was better for me to work with these kids without knowing all the details of their pasts. When I taught them, I wanted to concentrate on the things we were doing together and the qualities that make all of them incredible kids, not their heart-breaking pasts. All these three art camps by Athentikos have been different yet equally meaningful for me. The highlight of this last camp was the process with the girls. Again, like after each of these camps, I feel that I have been operating with something that is like the most important thing on Earth. And that my heart is exposed and broken in a way that it hasn’t before. It feels absurd that I wouldn’t return here anymore. I want to preface this blog by saying that I am not a dancer. I went to a week long summer dance camp when I was 6 or 7 years old and that is where my professional training ends. The only other dance I do is my crazy, cleaning dancing I do with my roommates when we decide to clean our rooms. I had been doing the group dance we learned in large group every day, but that was a lot less intimidating than a class. No one would notice me in the huge group dance, but a class was smaller. I realize now I probably could have said no to Amelia and found something else to do, but I hate to turn down a new experience, so I went anyways. *hint hint – it was me*. Now I know that dance is good for people. Dance and movement therapy is a growing field in psychology. According to Butler, Snook, and Buck (2015), “Community dance is capable of challenging perceptions of what is considered to be dance, and it enables an aesthetic to emerge where people can redefine who can and cannot dance and challenge notions of what dance is”. That quote is what Kati’s dance class was all about. It was not about being a skillful dancer, but about letting go and having fun. I didn’t want to be the one everyone was watching, but I knew that if I let all my nerves show, it would set a tone for the girls to feel like they needed to feel self-conscious and awkward too. And it would have killed me to see them feel like they’re anything less than beautiful creations of God. Then, as I had that thought, I realized that I should be treating myself the same way. I’m God’s creation too. So I powered through my discomfort and I was embarrassing in the most fun way. I acted silly and I didn’t care what anyone thought. All I wanted was the girls thinking that they could dance and be silly too. The next part of the workshop was in a group of 4 girls, each taking turns creating different moves on the count of 4. Then finally, we got partnered up one on one. The girl I partnered with seemed somewhat unsure of herself. She had the shy kind of smile that I recognized as apprehensive, but interested. I tried to give her my best look that said “I understand the nerves, but we can get through this together and manage to have fun too.” And we did. We laughed, danced, switched chairs quickly, and even accidentally ran into each other a few times. 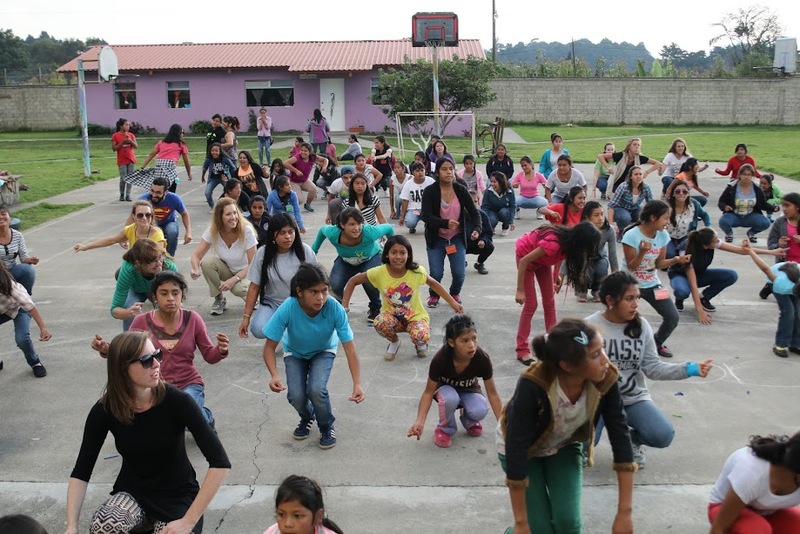 Butler et al., looked at community dance in relation to cancer patients, but I think if they had expanded their study, they would have found similar results in girls like the ones at camp. They found that “…the simplicity of the gestures and movements offered a way of making something meaningful out of their shared journey” (2015). We might not be professional dancers, but we were having fun together. And after we finished I looked around, it wasn’t just me and my partner. All the girls were having fun and Kati was beaming with pride just watching them. Am I going to drop everything and go join the nearest dance class or quit school to pursue becoming a prima ballerina? Definitely not. But will I take the joy and confidence I learned and apply that to other new and scary things? Yes, I like to think that I will. Even more importantly, I hope the girls take that with them too. Kati gave us 2 life lessons at the beginning of class. 1) Cry when you want to cry and 2) Ask questions when you don’t understand something. By the end of class, she’d taught us a third life lesson: Dance. Take the chance to try the things that seem scary at first. Later that evening I even tried to learn how to swing dance with some of the other volunteers. I haven’t nailed “The Pretzel” yet, but maybe with a little more practice! Being willing to take the risk of failing or looking silly in the spirit of joy is the most I could hope for any of us. 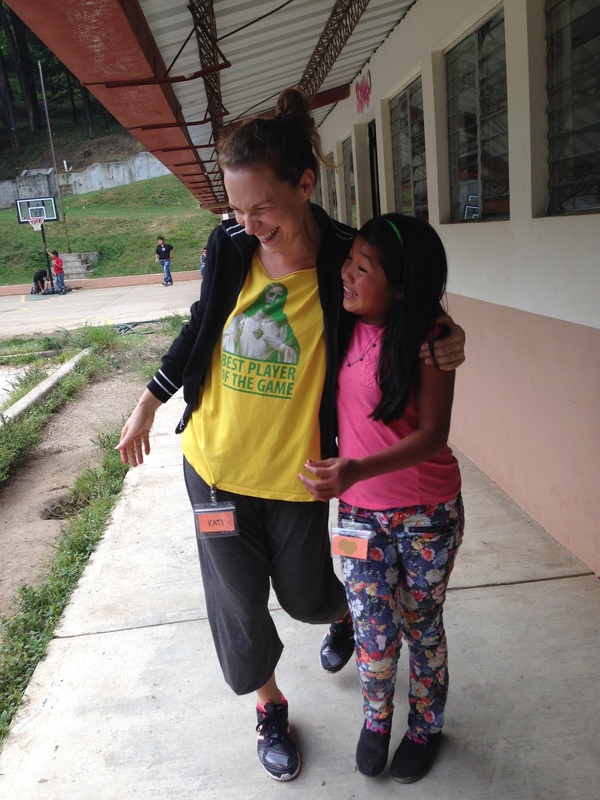 I named this blog after Lee Ann Womack’s song, I Hope You Dance, because it’s the epitome of what Kati taught us and what God hopes for us. 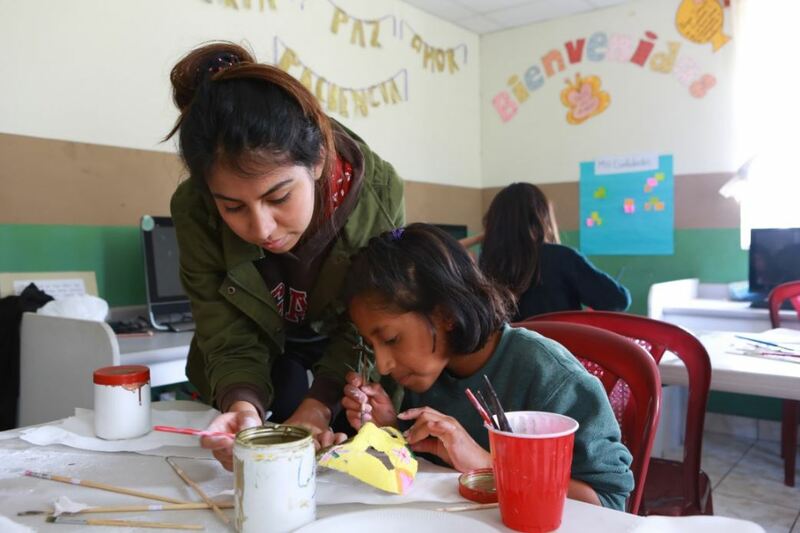 I’m Ivette, a Guatemalan I AM ART volunteer and currently a full time university student. In addition to working with I AM ART, throughout 2016 I was also temporarily an interpreter, nursery tea cher, and radio host. I suppose you could say I do my best to fulfill any need in Jesus’s kingdom. 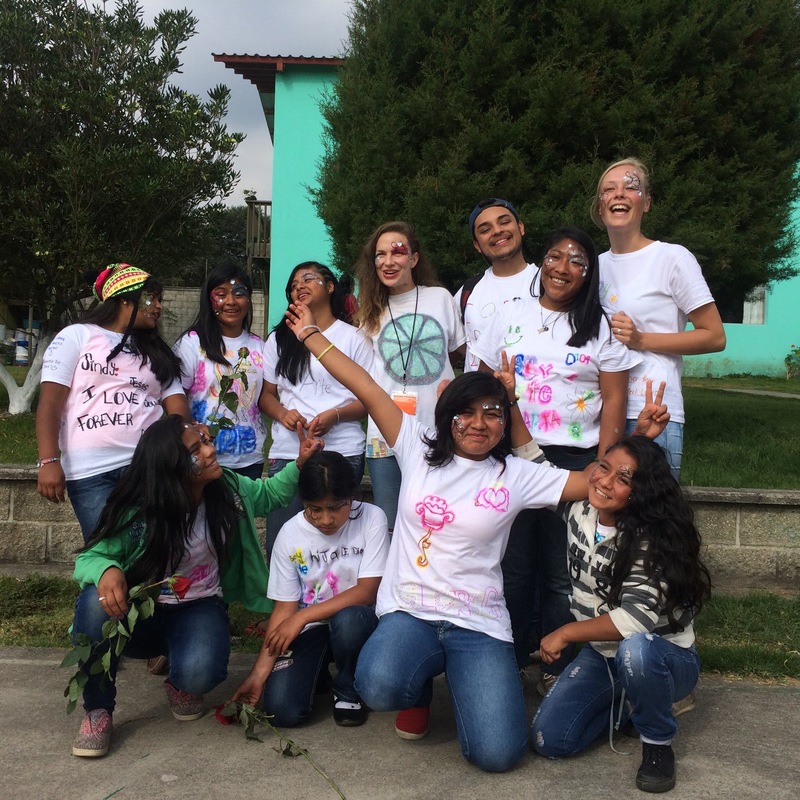 My first I AM ART camp was at Casa Bernabé in October 2016 as an interpreter and it was one of the greatest weeks of my year. I was able to be part of an awesome experience, so when Athentikos invited me to be part of the last camp of the year, I was excited to work at Oasis. Because of the incredible time I had, I now want to share my experience with you. As the days passed in the week, our relationship with the girls got closer and our hearts started to become full with God’s love. 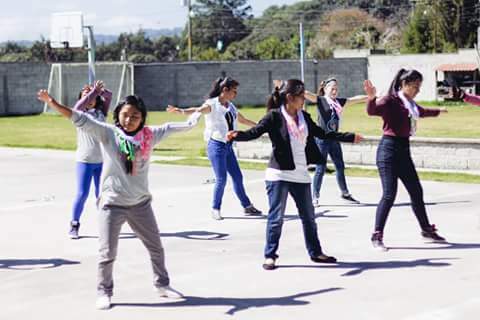 I, as an interpreter, try to help the international volunteers get that beautiful connection with the girls, but this time I wasn’t “just” the bridge between English and Spanish. The I AM ART camp started Monday morning but I didn’t get to Oasis until Tuesday, so I didn’t know the girls yet. My first time in the room, the girls were quiet and shy. They looked concentrated on their projects with the instructions that Becky, the collage workshop leader, gave them. I didn´t know anything about collages until that week. 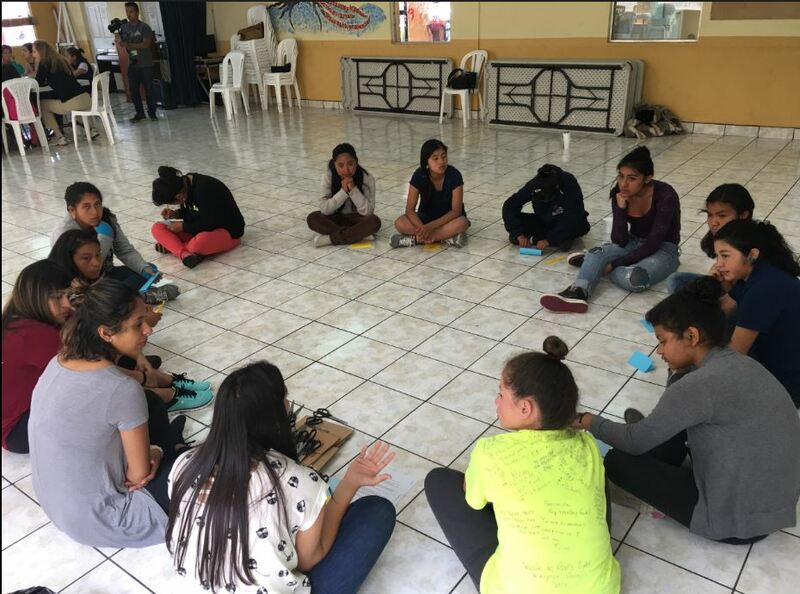 Everyone was focused on what they want to express for the first two days, so they were quiet at first, but then I started seeing the girls open up to the workshop leaders and to their projects as well. I watched the girls using bright colors and different shapes and I enjoyed seeing the girls experiment with something new. Even though the girls followed the instructions given, I could see their personal creativity and the love they put into their projects. It was like watching a super famous artist working on her next masterpiece; each girl was putting on a unique touch that would be hard to replicate. I saw real artists doing what they love with a variety of materials like glue, paper, tape, canvas, paper punchers and even nail polish. They were able to express through art what some of them are not able to express with words. So, just as it happened to me I bet it happened to the girls: we all started with an idea of how the week is going to be, but never imagined what God has prepared for us by the end of it. The entire week was an art piece. Just like Becky said constantly, “When you make collages, and a rt in general, you never know how it’s going to look at the end, but that’s the beauty of art.” After the conflict day (Wednesday), I saw the girls more connected and comfortable with what they were creating and trusting that the final project would look amazing. And it did! In a snack break we had Thursday one of the girls said, “That is what life is about, you don’t know what’s in store for you tomorrow, but you are the one who’s creating your most wonderful and colorful masterpiece”. It was a very blessed week for me because God used the girls to show me that it’s time for me to work on getting closer to Him and trusting Him on another level. I was questioning myself about my relationship with God, but it looked so easy for them to have faith in Him. They showed me how much easier it can be just by trusting every day in His hands. I want to finish this with a small story that had a big impact. On Thursday night at the bonfire, one of the girls from my workshop approached me and surprised me with a handmade letter. She is Carolina*. She is energetic, smiley, delicate and smart. During the week, she was always smiling and giggling, giving her opinion, and actively participating with the collages. I wasn’t too close to the girls at the beginning because as the interpreter, I usually think that it’s the workshop leader who they should remember and not me, but this time it was different. I didn’t read the letter until I got home after camp, and I was surprised that she wrote, “I’ll be praying for a man who will protect you, and who will love God first and you after, for you to have hope in God’s plan.” You might say “how sweet!” and it certainly was a sweet gift, but it’s even more heart-touching to read this from a girl that suffered through mental and physical abuse. I’m not sure why she mentioned finding a man in the letter, but what I am sure about is that she cares about me and others, just like God cares for her. 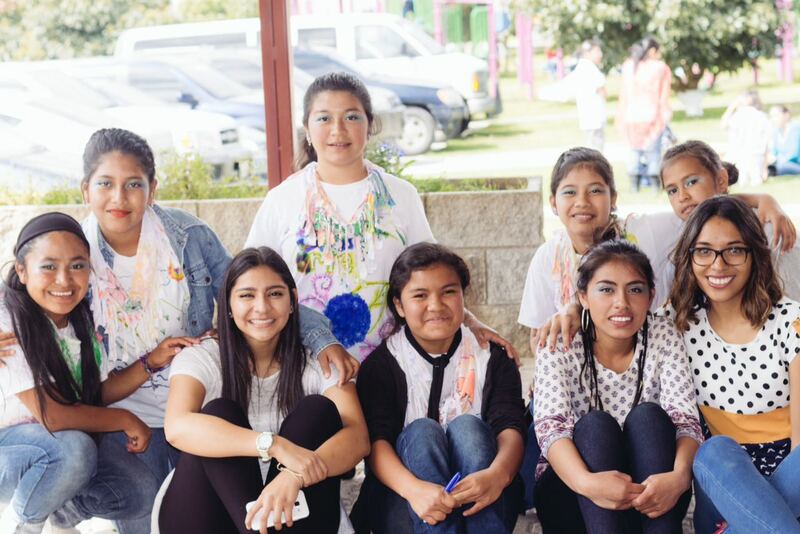 These girls learned that in God’s love, there is great healing. They are mighty in God’s strength and what I love the most about them is that they share it with others. Everyone involved in the camp was hit with this truth: God will talk to your heart no matter if you are the organizer, the workshop leader, or an interpreter. Remember as you do God’s work to bless others, as they will bless you back. A couple of weeks ago we celebrated Christmas, a feast of thanksgiving for the incredible fact of the incarnation—that God would take on human nature, including human flesh, to redeem it and draw us into union with Him. “The Word became Flesh and dwelt among us” (John 1:14). Just in case you’re rusty on your Latin, the word incarnation quite literally means en-flesh-ment. To incarnate something, then, is to en-flesh it, to give it physical properties. So what does that have to do with making art? As I’m learning from Madeleine L’Engle in her book Walking on Water, and as she learned from artists and theologians before her, to make art is to incarnate an expression of the soul. If our bodies are the incarnations of our souls themselves, our art may be the incarnation of an idea, emotion, desire, belief, question, or some other movement of our souls. God inspires us to make art about those soul-stirrings, and He even inspires our specific artistic choices. When the piece is finished, we step back to contemplate it. Now the colors, words, shapes, and chords—the incarnations of our soul’s movement—teach us more about those stirrings. They help us understand what we feel, believe, wonder, hope, etc. and why. Essentially, God now teaches us through the concrete piece of art He has just inspired us to create. Mind-blowing, right? God allows us to share in His power of creation. We are artists, and we are tools in the hand of God. Rather, to be an artist is to be a tool in the hand of God. So how does this process play out for the children who participate in Athentikos’ I AM ART camps? In case you’re new to the I AM ART concept or need a refresher, the I AM ART five-day curriculum centers around story. On the first two days of camp, the kids begin work on a piece that represents who they are and where they come from. They craft their pieces lovingly and are often very proud of the results. 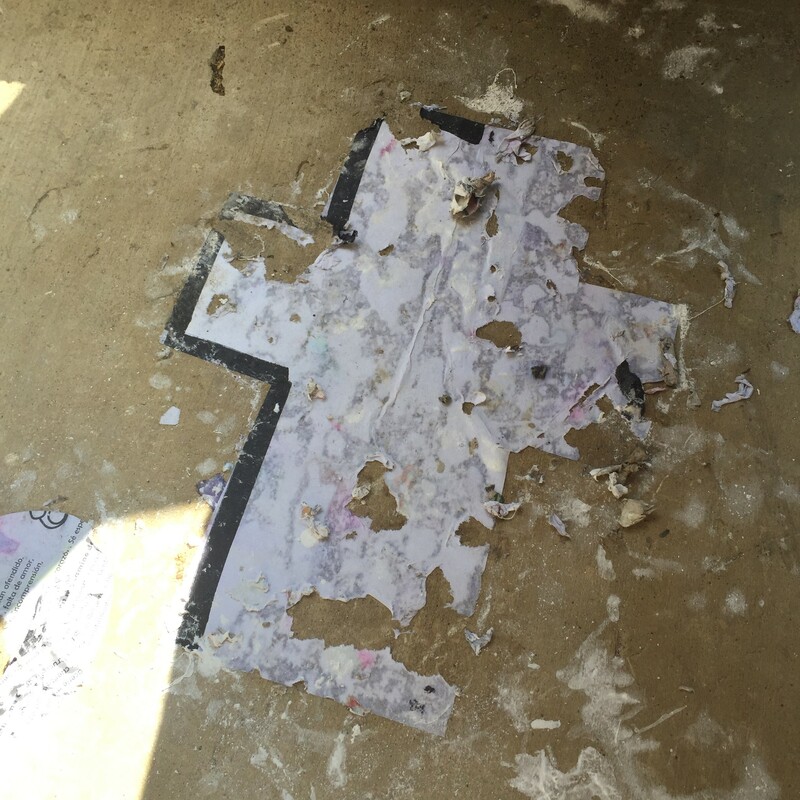 On the third day of camp, the children are instructed to drastically modify their piece in such a way that the piece looks, to them, destroyed and irredeemable. Faces are downcast and dreams seem ruined. 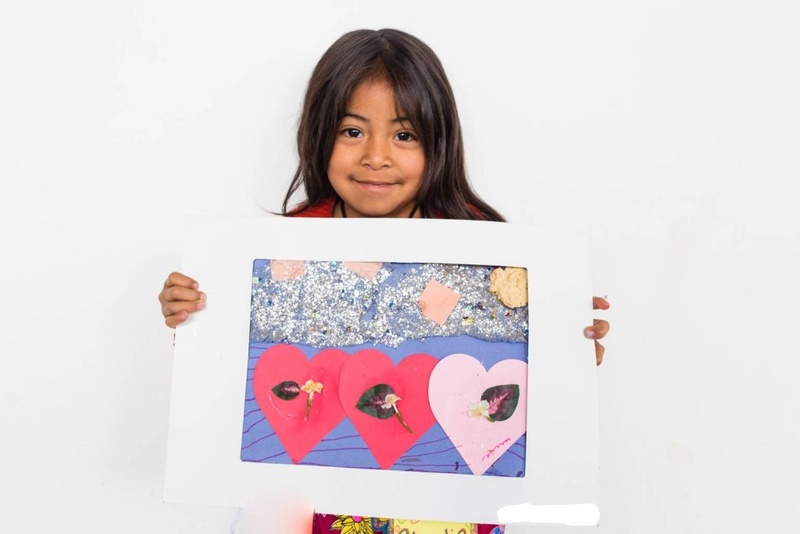 But then, during the fourth and fifth days of camp, the artist leaders show the children how to continue crafting their piece into a new work of art that is even more beautiful than they imagined it could be. What is ugly can become beautiful. What seems impossible is not impossible after all. What seems to be within our control is not within our control, but it is controlled by the Master Artist, who loves us even when we don’t understand what He asks of us. The art that the children take home with them is an incarnation of this new perspective—a physical reminder they can touch and feel when things look dark again. And this incarnation is important, because sometimes when we are close to giving up hope, all it takes is a beam of light through the clouds, a hand on our shoulder, or a symbol of hope lovingly painted, to remind us who we are. And believing you are God’s masterpiece changes everything. AWAKE: fully conscious, alert, and aware : not asleep. 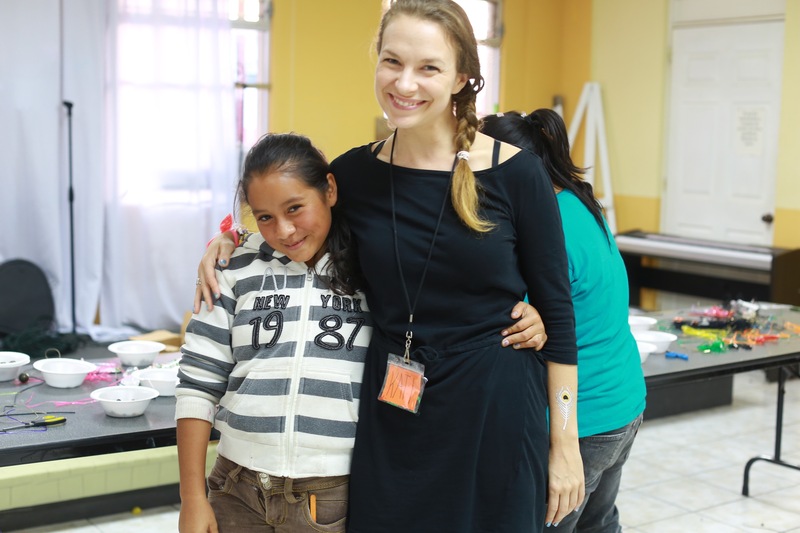 We have been leading teams to Guatemala for nine years now through the Athentikos documentary projects and now the I AM ART camps. 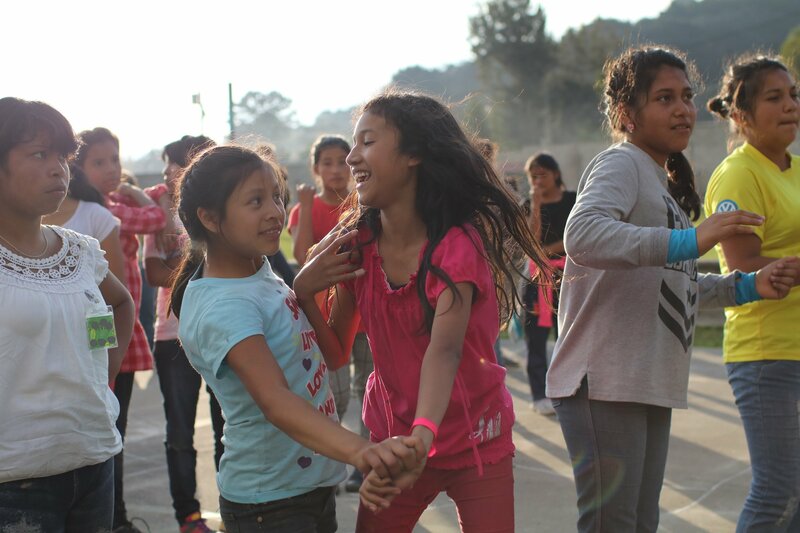 Over the last 5 years, we’ve led eleven camps in Guatemala with 6 different partner organizations, 120 artists/volunteers, and nearly 2,000 at-risk children to transform pain into purpose through creative arts and God’s greater story of redemption. I have the honor to lead a camp each year and I love it! It’s a highlight of my year. It has been humbling to see this vision grow as well as how others participating in and facilitating the camps experience something new within themselves. I love showing others the beauty of Guatemala for the first time. I love seeing the team bond, as it’s significant that most people come on these trips not knowing others. 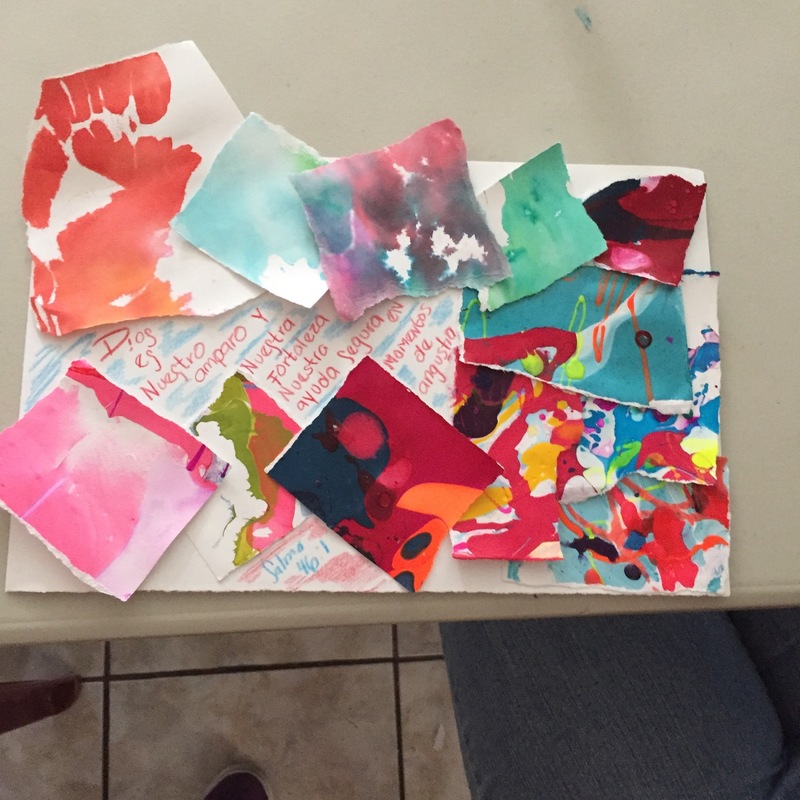 I love seeing the kids get excited about their art projects and hearing stories about God’s healing in all of our lives. I also love the fun times of dancing, playing card games, and site-seeing with the teams. It’s all significant and each camp leaves a deep impact on my heart. While some aspects of the trip may not be as awe-inspiring to me anymore… like seeing an active volcano or all the colorful textures in Antigua. I always leave these trips with a new sense of life stirring in my heart. As we led our teams through some mindfulness exercises to be in the moment, I sought to understand the impact on my own life. What is it about these trips that stir something new in my soul? Part of my soul re-awakes each time we travel to Guatemala. I’m not sure if it’s because I’m removed from my day-to-day routine and connecting with God, others, and myself in a new way, or if being in a different culture allows my perspective to shift ever so slightly. Maybe it’s because hearing stories of great heartbreak and amazing healing is inspiring. Regardless of the triggers, part of my soul awakes during each trip. 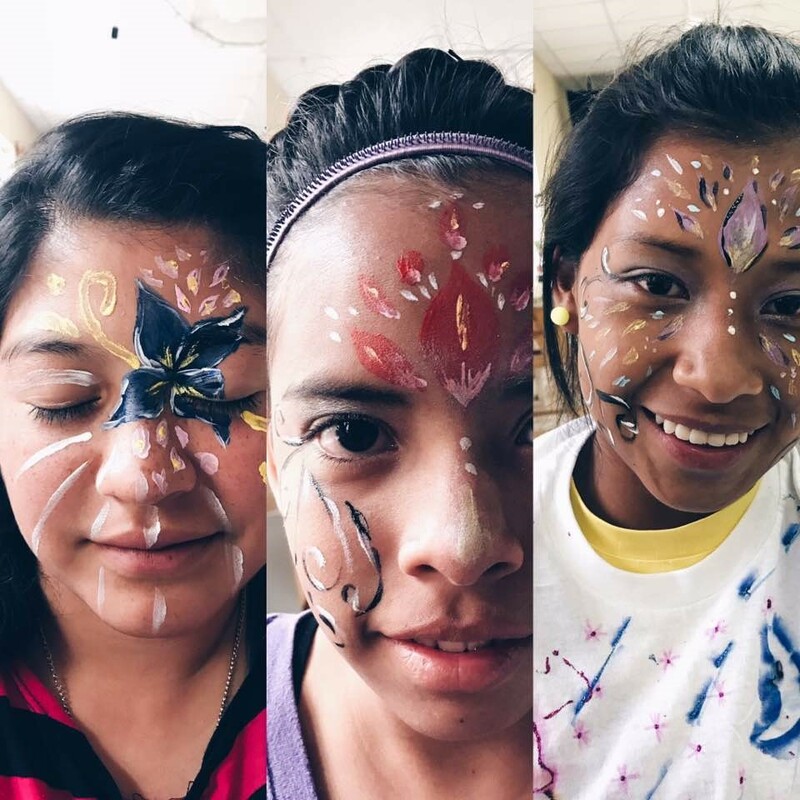 I had a hard time writing this blog because it’s hard to explain the feeling of your soul awakening as it’s difficult to explain the powerful impact of our I AM ART trip. Many times I have said that it’s hard to express our experience in words. And that is the power of art: to express an inner abstract idea. Throughout time, people have used art for this same purpose— to communicate their stories, to worship God, and to express the thoughts of their soul. Dance, music, painting, sculpture… all of these and more allow the soul to express itself in ways our words cannot. And sometimes you have to find yourself in the journey of creation. 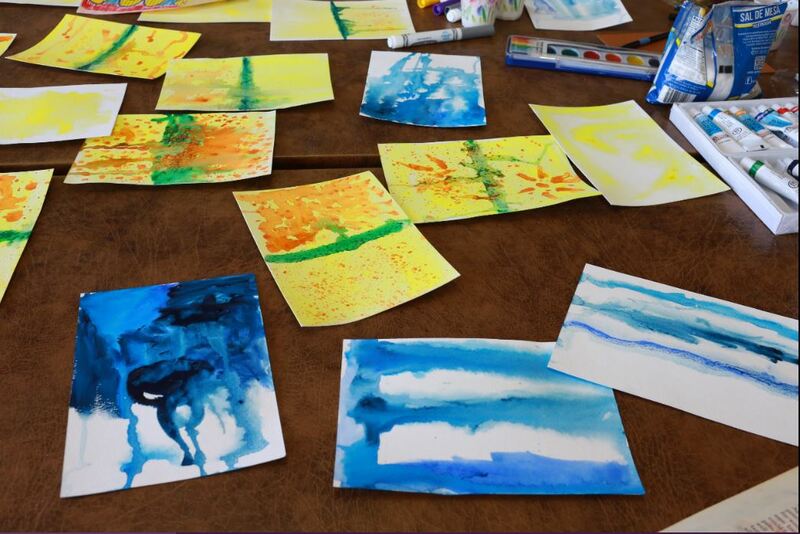 In addition to leading the team, I taught a water-color class this time around. I love the fluid nature of the water and the paint. I love putting water on the paper and adding color and watching it create with some direction. You can kinda direct the outcome of a piece, but for the most part the nature of watercolor technique is to allow it to “develop” itself. You have to really let go of control and watch the beauty unfold. And the creation is beautiful!! While I LOVE this and think it’s really a simple medium, it was difficult to teach and for the most part, it was difficult for the girls to work with the water instead of controlling it. We did a variety of techniques and projects that followed our themes, but in the end the essence of the teaching was in working with the water and how it relates to our relationship with God. As I sat and worked with the girls, I felt a connection to my soul that I rarely experience back “home.” The simplicity of creation allows the soul to feel, explore and breathe. 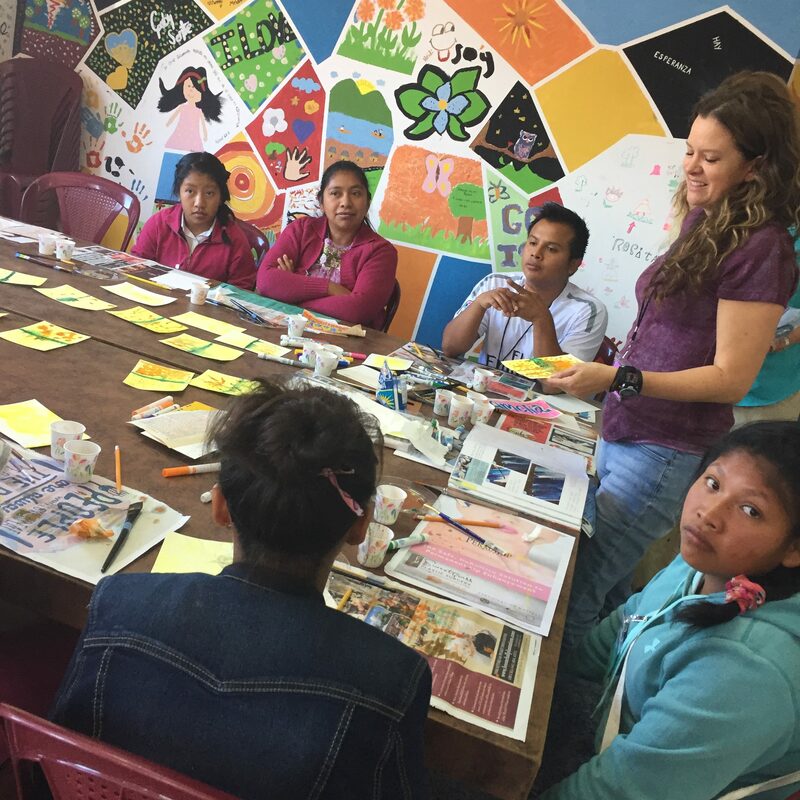 As I look back on 2016, I am very grateful for the four I AM ART teams in Guatemala. 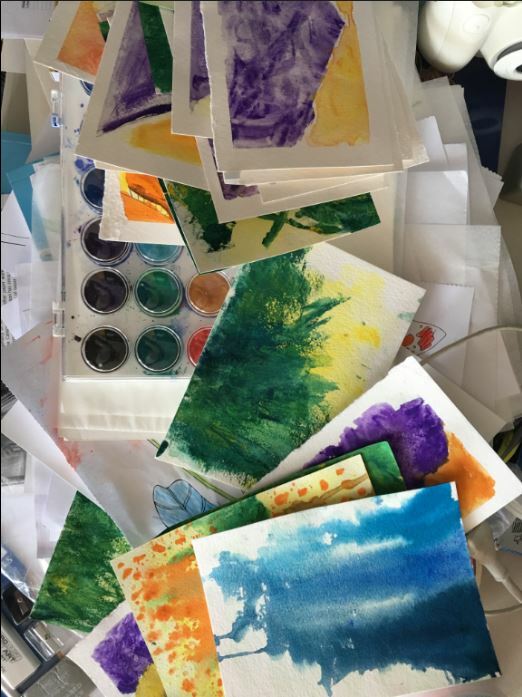 Like the creation of the watercolor pieces, our leadership team took steps of action to put “water and color” on the paper, but it was God that created the beauty that unfolded through the camps. 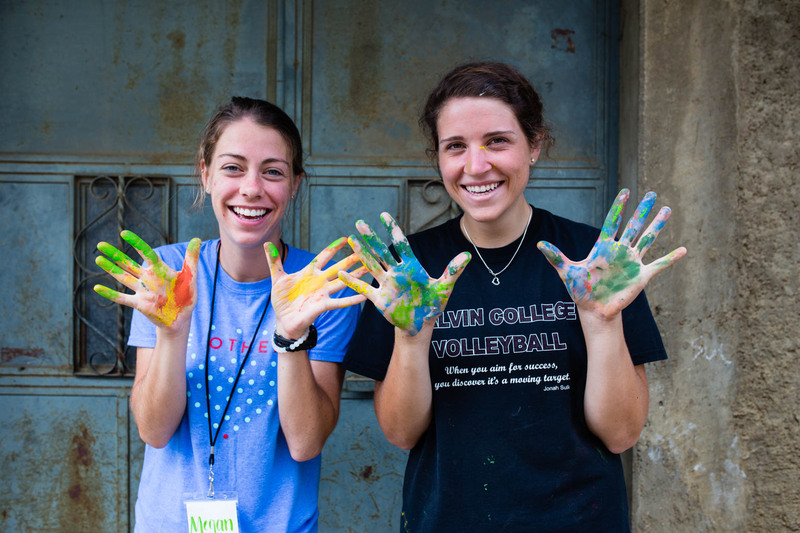 The people on our teams are the core of the experience and the reason we are able to offer the I AM ART camps. I love the deep sense of community we feel during our time together as well as getting to know so many different types of people. I am grateful for the kids who willingly follow our direction in the creation of their art projects and humbly share parts of their stories with us. 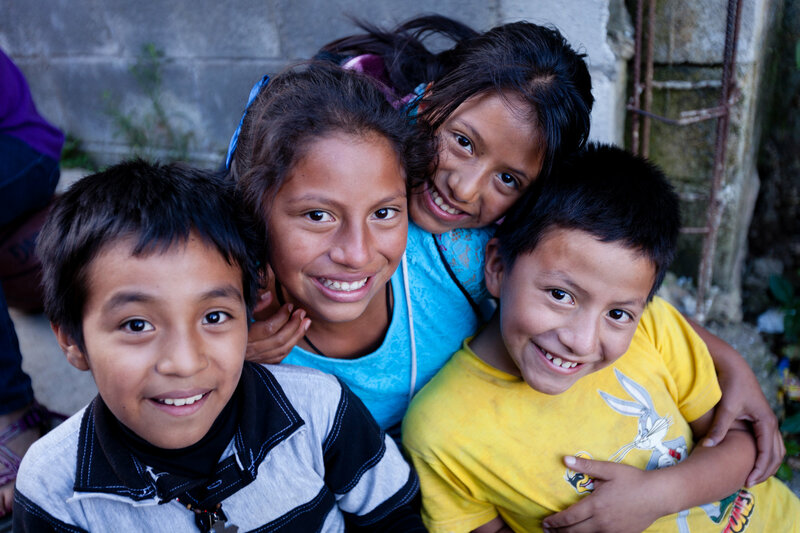 I am also thankful for our partnership organizations: Vidas Plenas, Lemonade International, Se Luz, Ten Fe, Kids Alive, The Oasis Home, Casa Bernabe and Friends of Children Everywhere who generously opened their communities to us. I hope in this New Year that our collective “artwork” will develop even more into a grand piece that only God can direct. It’s difficult letting go, listening to the depth of your soul, and taking steps in and towards God. Even though we love the I AM ART vision and want deeply for this vision to grow, at times it is extremely scary to trust God in this. We need money, people, and leadership to accomplish the great vision God has laid on our hearts. Our hope is that we will all continue to be the color that God is using to create this beautiful piece of art. While this blog isn’t necessarily about an opportunity to give, I do want to make that offer: If you have joined us on an I AM ART trip in the past, you understand the power of art and you know the sense of your soul awakening in new ways. We need you to continue to be a part of this by financially supporting the vision, please consider joining our monthly financial support team at http://athentikos.kindful.com/. 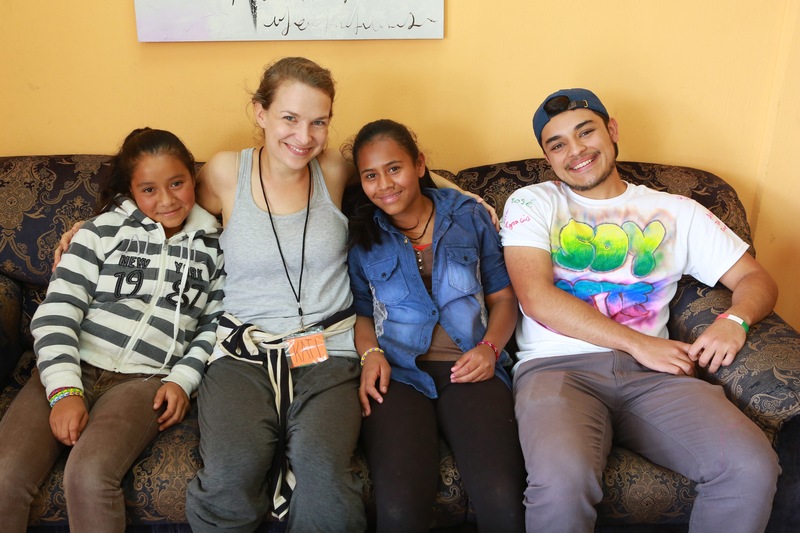 If you have not yet been able to go on a trip, you can still support us! You can donate using the same link listed above and/or follow us on social media. Be on the lookout for future I AM ART camps you might want to join or other ways to support Athentikos. Your investment will make a difference in the communities we serve. To get the full lyrics to this song click here. Many, many, many thanks to all who are a part of our community, who have shared stories, invested, loved and listened. You have left an impact on my heart and many more. Happy 2017 to you all! 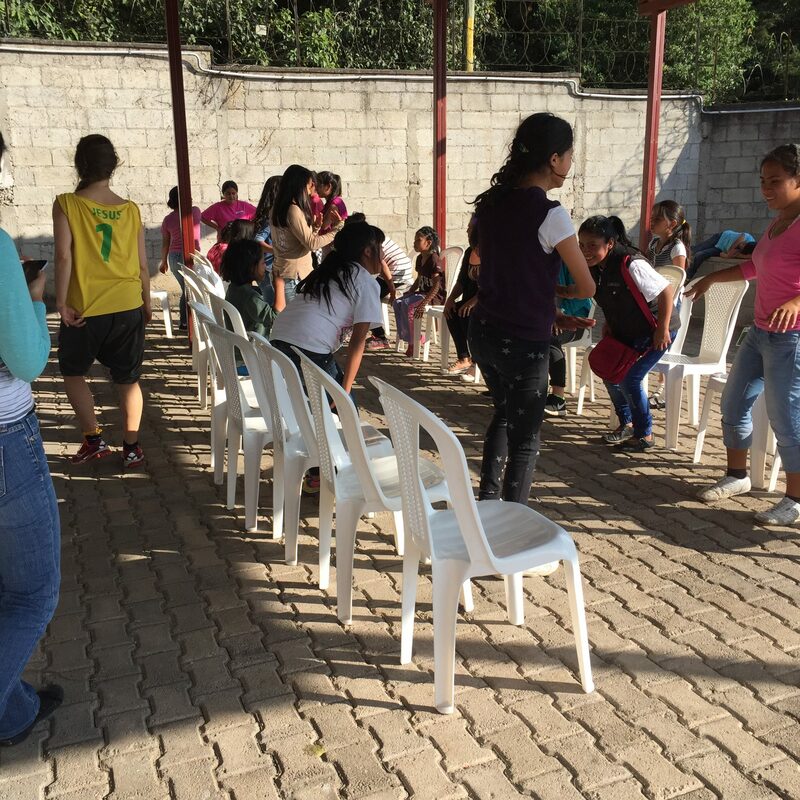 The following blog was written by one of our Guatemalan volunteers, Irene. 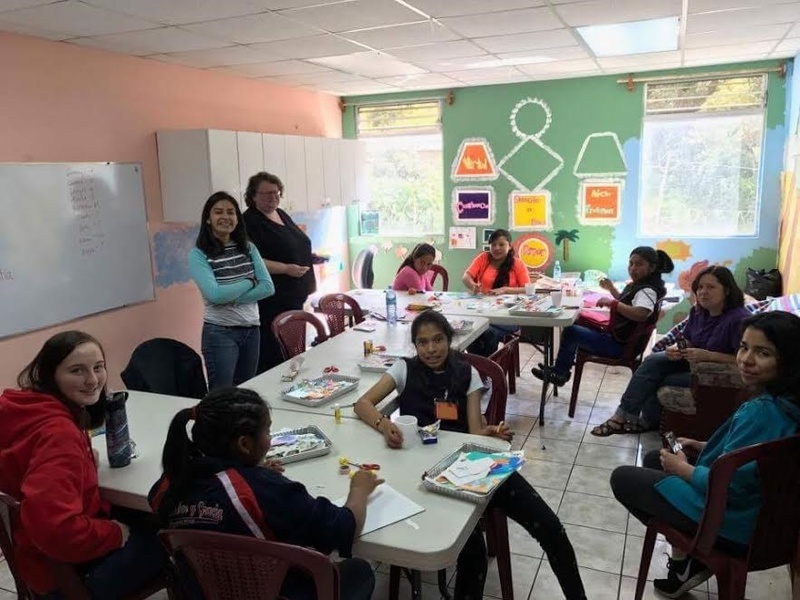 She has volunteered with Athentikos as a translator in the past, but this year she took the chance to become a workshop leader. We are incredibly grateful for her creative and passionate spirit! Hi! My name is Irene and I’m a student of translation and interpretation from Guatemala City. 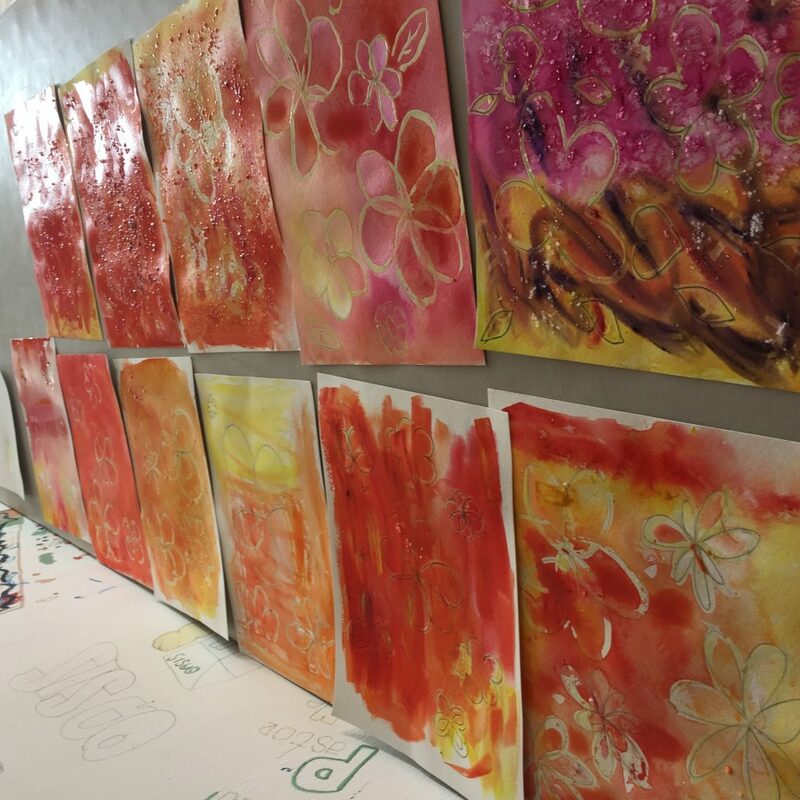 Last year I had the opportunity to work with I AM ART (IAA) Camp during Fall 2015 at Oasis. As several times before, I was prepared for a normal week of interpretation, but this one just changed my life and my way to live. I’ve been a Christian since I was 7 years old but I’ve never seen the love of God expressed through art like I did last year. I was the interpreter for Amelia and Tina in their self-portrait workshop and I loved everything about it! I loved their creativity and the way they worked with the girls, even with the language barrier. The love of God could be felt throughout the whole week and I just knew that I wanted to come back and work with IAA again! On the other hand, besides my interpreter profile, I am also an artist. I’m a drummer, bassist and singer. This is why I fell in love with Athentikos — because they use art as a tool to spread the word and love of God. 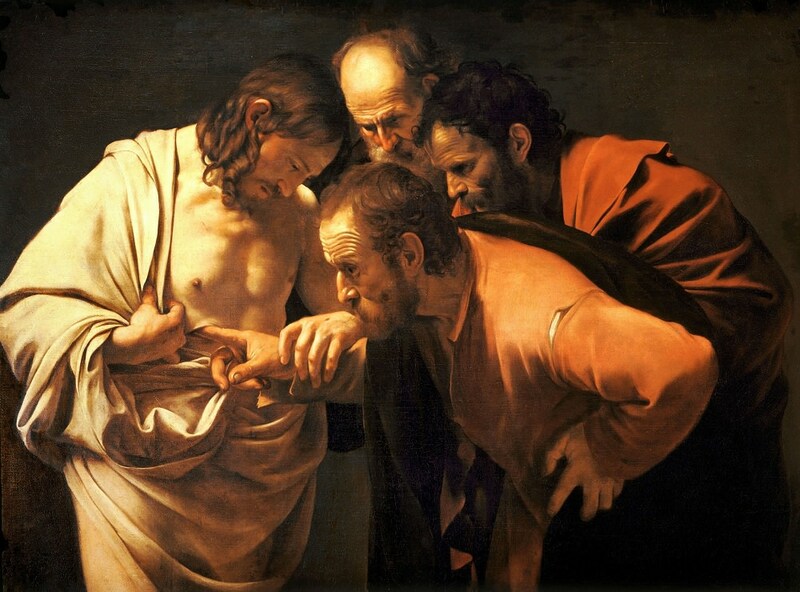 As a Christian, I’ve seen and heard of God’s love and care through words but as an artist I’ve never seen how it can be expressed in such a powerful way: no words, no long sermons, nothing but ART. I completely understood that we are God’s Masterpiece, and that if He has given us gifts, we must use them to serve others. So, I took the challenge and jumped into a new adventure, leading a workshop at the Art Camp Fall 2016 at Oasis. This year I was beyond excited to go back and see the girls again. What I didn’t expect was that my love for that place and all the girls was going to be greater now! I cannot express how different it is to be on the side of the interpreter and the side of the workshop leader, both of them are awesome experiences but way different. As an interpreter, I didn’t have to care about what project I was going to do, how much material I was going to use, how conflict day could match with the week project, etc. When I decided that I wanted to participate, I didn’t have a clue about what kind of workshop I was going to teach. I didn’t feel prepared to be a workshop leader and sometimes I thought about declining the invitation and just interpreting, but I knew God was calling me to do something different this time. I was worried about whether the girls were going to accept me, or if they were going to like our workshop. I was worried that my personality was not going to match with theirs, but once again, God surprised me. This year Ale, a friend from church, and I led the dance and rhythm workshop. It included jazz movements and a very basic drum technique. We were really looking forward to the camp. She didn’t know what to think since this was her first time working with Athentikos and I didn’t know how to react since this was my first time as a workshop leader. I wanted the girls to have the best experiences and to leave every worry in God’s hands. I wanted them to express whatever they’ve been through, with art, and it surely happened, but it also worked with me and Ale too. Last year I didn’t have a strong connection with the girls because I was focused on my role as an interpreter, (as I’ve been taught, the good interpreter is the invisible one). I thought that this year just being a “workshop leader” would mean things were going to be different and the connection with the girls was going to be quicker, but it didn’t work like that…at the beginning of the week the girls were shy and a little distant. They would get distracted by the staff from Oasis that were helping us and it made things a little bit harder. By Wednesday (Conflict Day) we knew each other a little better, but that day we had a perfect connection with them. We got the chance to share with the girls the little things in our lives that have been a conflict to us and how to overcome those dark moments. They opened their hearts and allowed us to know their past. From that moment, for the rest of the week, things got better. We were blessed to have girls not only from Oasis, but also from two other houses of girls that have suffered sexual abuse. All of the girls are examples of forgiveness, love, fight and strength! Our workshop was divided into various activities: dance, rhythm and crafts. The main idea for our craft was to work on a t-shirt that the girls were going to use for their final performance. We got to Oasis on Sunday, they gave us the list of the girls, and with that came a huge surprise! The t-shirt sizes were way smaller than our girls’ sizes!! We worried, panicked, and lost track of what was going on and what was going to happen. 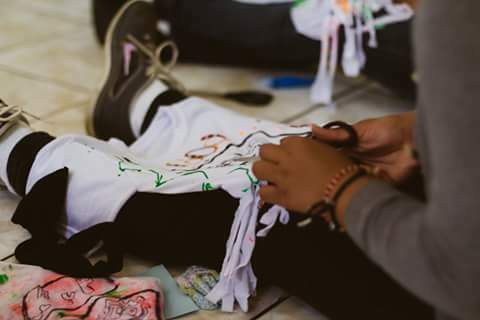 Thank God, creativity came upon us and we decided that the t-shirts were going to turn into a scarf. That changed part of our project but in the end, I think it worked better than the original plan. My heart melts when I see the pictures of their lovely and innocent faces! Their hearts are huge and their future is astonishing. 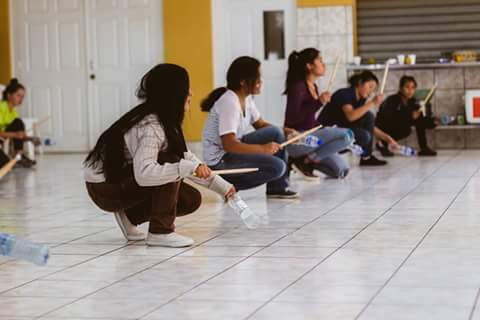 I will never forget these girls, how much they taught me, the way they made me feel when they called me “tía Irene” (they call “tías” the people that’s in charge of them, or the ones they appreciate), and of course how God worked through all of us with the amazing gift of arts. I know it wasn’t because of us, but it was through us. It happened because we are attending to our call. Well done Team Oasis 2016! We made it! 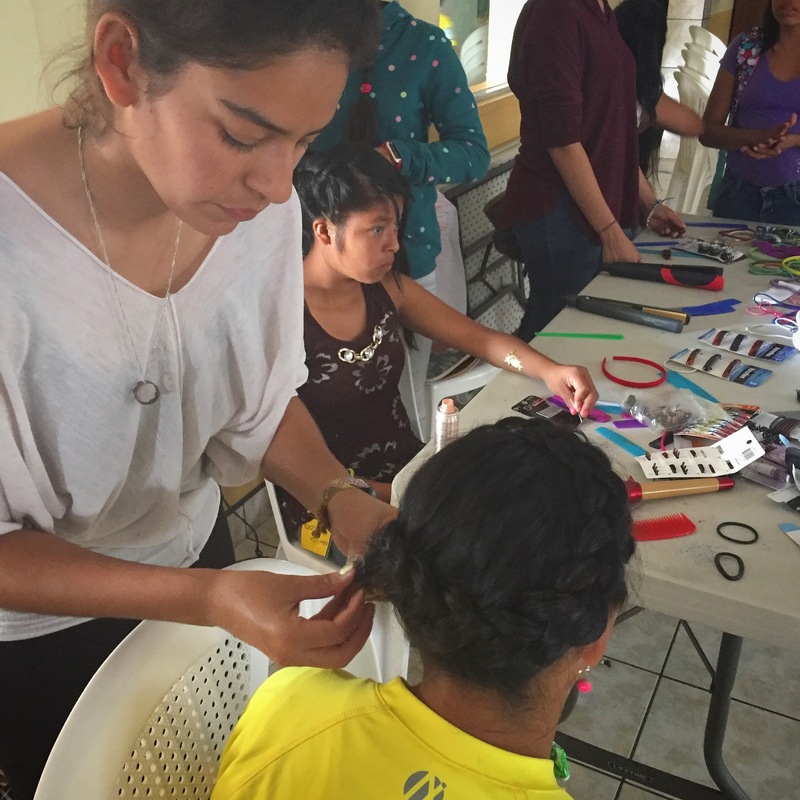 One of our Guatemalan volunteers, Cristha Fuentes, wrote the following blog. 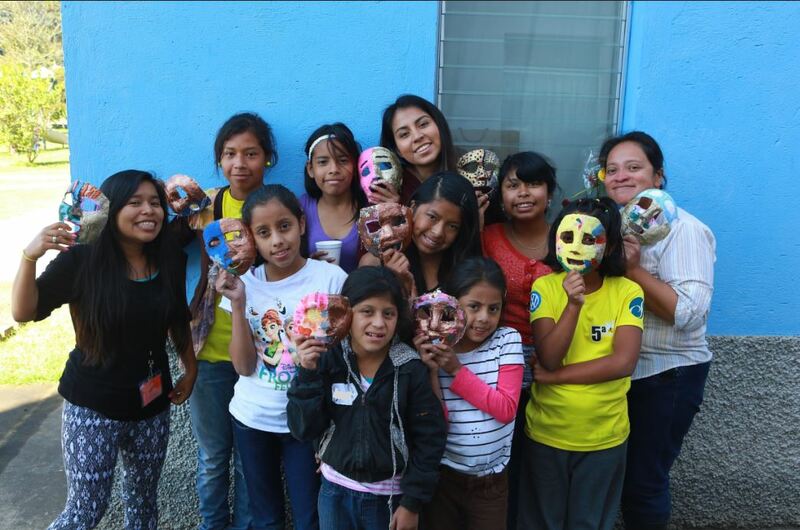 Cristha assisted in our mask-making workshop at our Oasis camp this Fall. We loved having her creative and happy spirit as part of our team. On Tuesday, I was sitting next to the dorms where we were staying and admiring a beautiful sunset. 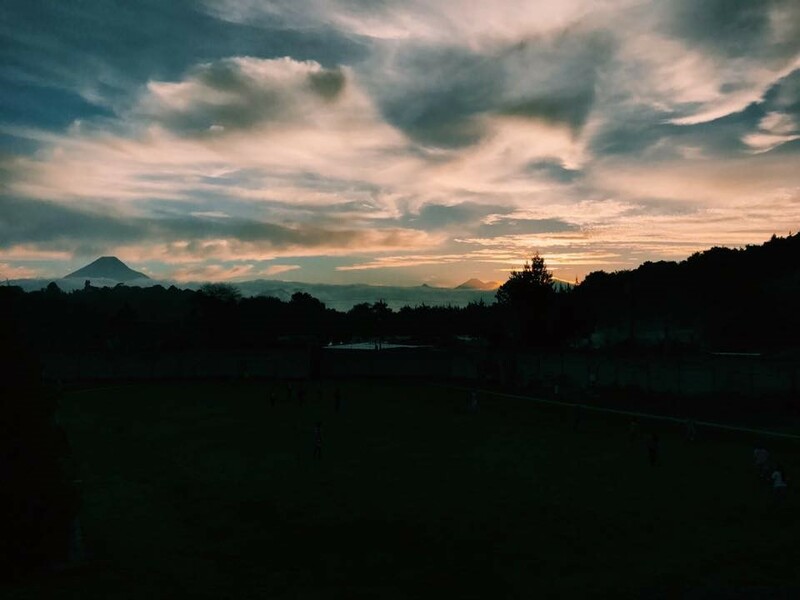 While I was enjoying the sunset, I could hear the girls playing soccer close by and I suddenly started feeling overwhelmed by the outrageous love God had shown me that day. All of these feelings brought to my mind the verse of the day and especially the word “workmanship” and how if we search for its Hebrew root it actually means “poetry”… why did this matter at this point? Because even though the beauty of the sunset was breathtaking, God’s poetry wasn’t there; it was in me, and not only in me, but also in the girls playing soccer and in pretty much everyone around me. We are His poetry, His masterpiece; despite everything we’ve done, in His eyes we are perfect. And that single thought reminded me how Guatemala is not just beautiful because of the landscapes it has, the volcanoes or even the stunning lakes; Guatemala’s beauty lies in its people and their stories. That was something I didn’t realize until I was able to see my country through the eyes of the U.S volunteers, they could see us in a way we couldn’t see ourselves. I have no words to describe how much it fills my heart with courage and hope hearing how much they love Guatemalan people, and how they admire our capacity for resilience. All those things gave me hope and perspective on how God sees us, His Guatemalan poems. Since my first camp at La Limonada with I Am Art this past summer, I knew this was what I wanted to do for the rest of my life… for once I felt useful. So when I was asked to volunteer at Oasis I immediately said yes. I was thrilled to be with the girls and humbled by them trusting me with their stories. Nevertheless, on Wednesday I started feeling anxious about the idea of leaving them after camp. I had doubts like: “what will happen to them after I leave? Will they be okay?” All these thoughts were making me feel terrible and even guilty about coming back home to the comfort of my life. God knew how I was feeling, so He started working on me. During large group and the workshops, I started understanding how being there was my way of being God’s tool in a much bigger picture, much greater than the small fraction I was seeing. I was only a small brushstroke on God’s masterpiece, and like me, He is going to use other brushstrokes to finish what He had started in the girl’s lives. Therefore, I understood that being there was my mission and I could rest and believe God was going to be with them and finish His good work. So, “be still my heart and know that I am God”. ACT 3: …which God prepared beforehand, that we should walk in them. The biggest lesson I learned in this journey was: Trust in God’s process. For the workshops to be a success and the purpose of the camp be fulfilled, the girls had to trust us during the process. They had to go through all the steps even if they didn’t understand them. The girls had to go through the journey of creating something they considered beautiful, go through the pain of seeing that beautiful creation being altered through conflict, to finally be comforted by the masterpiece created after the restoration process. During the process we live in IAA, conflict was particularly harder than the last time I participated. 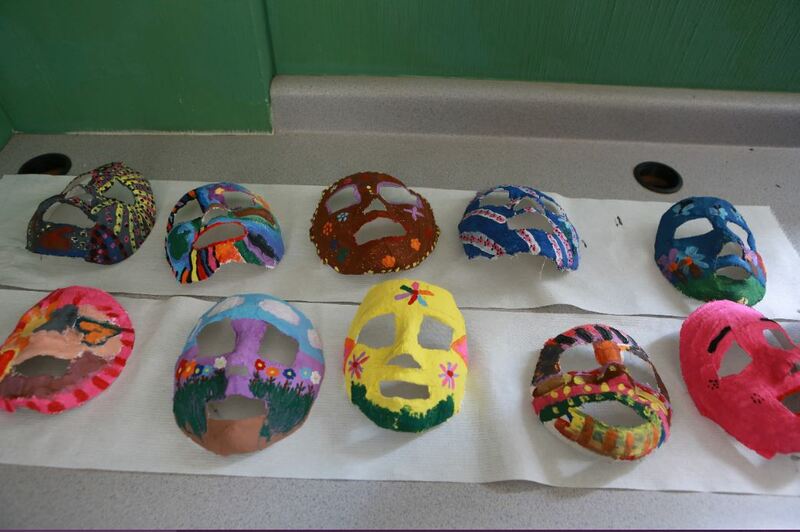 The girls had been working on their masks, and putting in their best effort to reflect who they were in each color and design they added. All of the sudden, on Wednesday, we asked the girls to grab someone else’s mask and destroy half of it. At first they got angry, they couldn’t even looked us in the face…for 10 minutes or so they stood quietly just looking at their masks, and suddenly I started seeing tears falling from their eyes; they started crying. Even if they didn’t understand at the moment what was happening they still did what we asked them to do. After that we had a group hug and we started praying for each other and talking about the experience. Of course, they were not simply crying about the mask, the girls went deeper in this exercise. In one girl’s words, they “went back to that single moment in [their] lives when [their] hearts got broken.” Hearing those words broke my heart too. I felt so guilty for putting the girls through that experience again. Even if I already knew the next day was going to be better and they would learn to find solutions and that God can fix anything… I still suffered with them. It was an emotional and hard experience, but above all it was powerful. For once, we were not teacher and student, we were sisters; their pain was my pain and my struggle was their struggle. We really opened our hearts that day and I know they will keep that moment in their hearts forever and I´m sure I will too. Later on that day, I was laying on my bed, trying to acknowledge all the experiences of that day and I realized that, that’s life and we need to trust that God knows the plans beforehand. He knew what would happen in the camp. He knows all our stories, and He knows how our stories will develop; we just have to trust He has control on the outcome. He says in Jeremiah 29:11 that He has “plans to prosper you and not to harm you, plans to give you hope and a future.” Our duty is to trust Him and enjoy the ride. Just trust in His process, trust that He has big plans not just for us, but also for each one of the girls at Oasis. Thank you to the volunteers for flying from U.S or Finland just to help my country and to fulfill God’s purpose. Thank you to Athentikos for using art to heal wounds and for giving me the chance to finally use my artistic talents in something that is not for myself. And thank you to the girls from Oasis for changing my life forever. 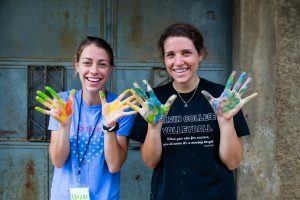 The premise behind the I AM ART camps is that through art—a physical, concrete means of expression and learning—God teaches us and draws us closer to Himself. I have seen this happen for both the children who participate in the camps and the artists who lead the workshops. The children learn how to look at their lives differently and see, instead of inescapable problems, opportunities to overcome their challenges and choose their own paths. The adults, meanwhile, also learn many things, including humility and trust. I AM ART camps are weeks of personal revelation for everyone involved. So back to the premise. Why has God decided to teach us these things through art camps? Why did He inspire Scott and Amelia Moore to begin I AM ART? Why didn’t He decide, instead, to teach us all of these things at church or in prayer? I’ve been thinking about this a lot lately, and I have a few thoughts. First of all, God of course does teach us these things in church and in prayer. But we are somewhat poor creatures, and often don’t understand Him. Or maybe we’ve fallen out of the habit of going to church and praying. Or maybe we were never in it. So in His infinite mercy, God seeks us through other means. But, art? Why something so concrete, so physical—something that gets on your hands and in your ears and often takes days to scrub off? I believe one answer to this question is that, actually, “man’s soul is not in his body as a hand in a glove or as a rower in a boat” (Summa Theologica, part 1, question 76). Mind-body dualism, popularized by the father of modern western philosophy, René Descartes, in the mid-1600s, is actually a lie. We are not souls caged in bodies. We are human beings and our substance is both soul and body, substantially joined. Perhaps this seems obvious to you or perhaps you feel shocked by the claim. I personally think it explains a lot about human existence and the Bible. Learning from the physical world is also corroborated by Scripture: “Ever since the creation of the world, His invisible attributes of eternal power and divinity have been able to be understood and perceived in what He has made.” (Romans 1:20). The list could go on and on, but the essential point is incredible when you think about it. Our souls and bodies are substantially united. We are not one or the other, we are the unity of both. God created the physical world from nothing as a divine gift to help us understand and love Him. This knowledge imbues absolutely everything with meaning and sanctity. And it is one reason that we can be sure God communicates with us through art. Blessed are the poor in spirit, for theirs is the kingdom of heaven. Blessed are those who mourn, for they shall be comforted. Blessed are the meek for they shall inherit the earth. Blessed are those who hunger and thirst for righteousness for they shall be satisfied. When you become an Athentikos team member for I AM ART, you are strongly encouraged to watch Athentikos’s documentary, Reparando. So, armed with my favorite pillow and blanket, I set up my laptop and sat on my bed with my roommate and we began watching. Neither of us really knew anything about Guatemala, so this was going to be an educational experience for the two of us. If you didn’t know, Guatemala suffered through a 36-year civil war, the longest in Latin American history. Their civil war lasted longer than I’ve been alive. 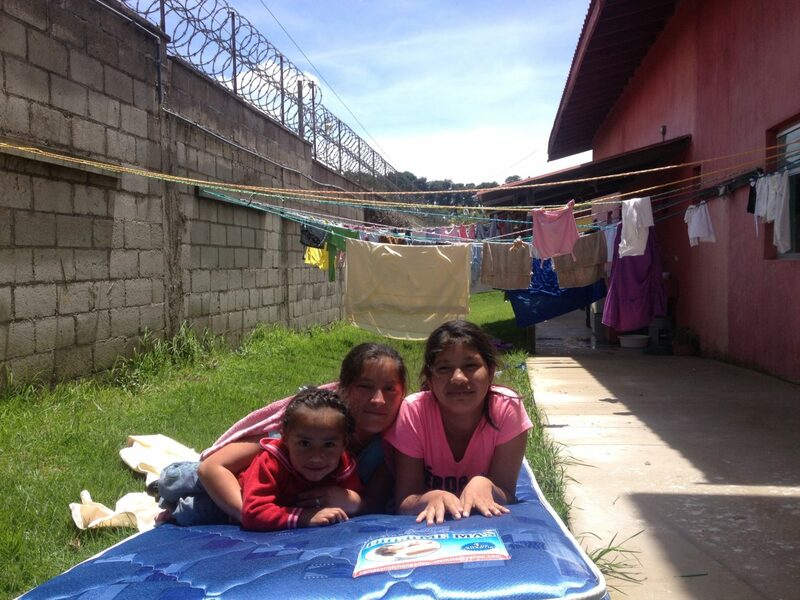 As a result, Guatemala has been struggling to rebuild, which is quite a challenge when poverty levels are high. 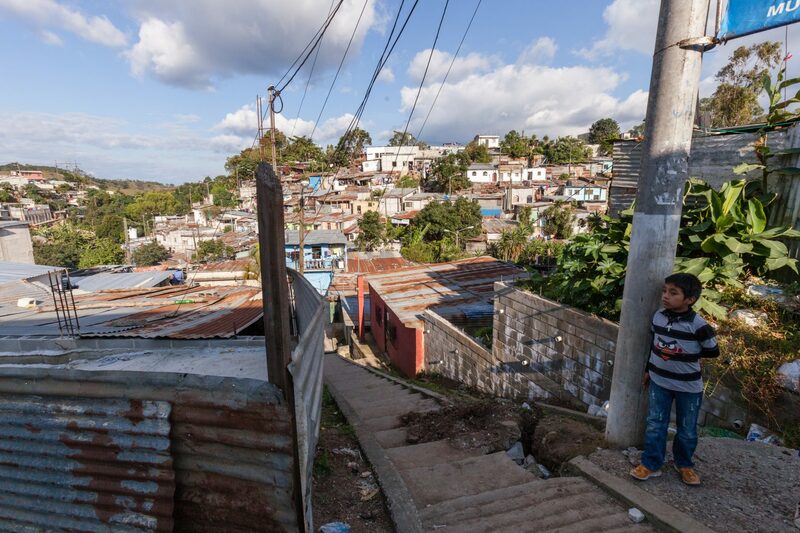 The most extreme examples of poverty are slums in “Zonas Rojas,” or “Red Zones,” where the crime rates are high and the standard of living is low. 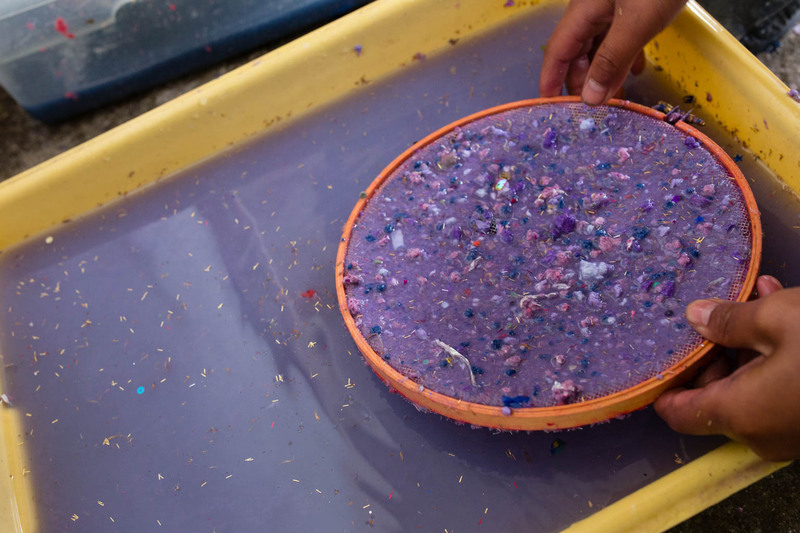 Reparando focuses on La Limonada, one of the largest slums in Central America, with an estimation of 60,000 inhabitants. The conditions in which people are living are horrible. There is violence, hunger, intense pollution — things that most of us could never even imagine. And some of the people living in those conditions are children. There are kids living in dangerous places, experiencing traumatic things, stuck in a cycle of poverty, all for a war they had nothing to do with. A study done in 1994 by Duncan, Brooks-Gunn, and Klebanov looked at poverty’s impact on child development. They concluded, “Family income and poverty status are powerful determinants of the cognitive development and behavior of children” (Duncan et al., 1994). And unfortunately, nothing about that conclusion is surprising. Poverty-ridden areas are known for drugs, crime, and low standards for education. This information sounds hopeless, I know. No one wants to hear that there are children in these conditions. 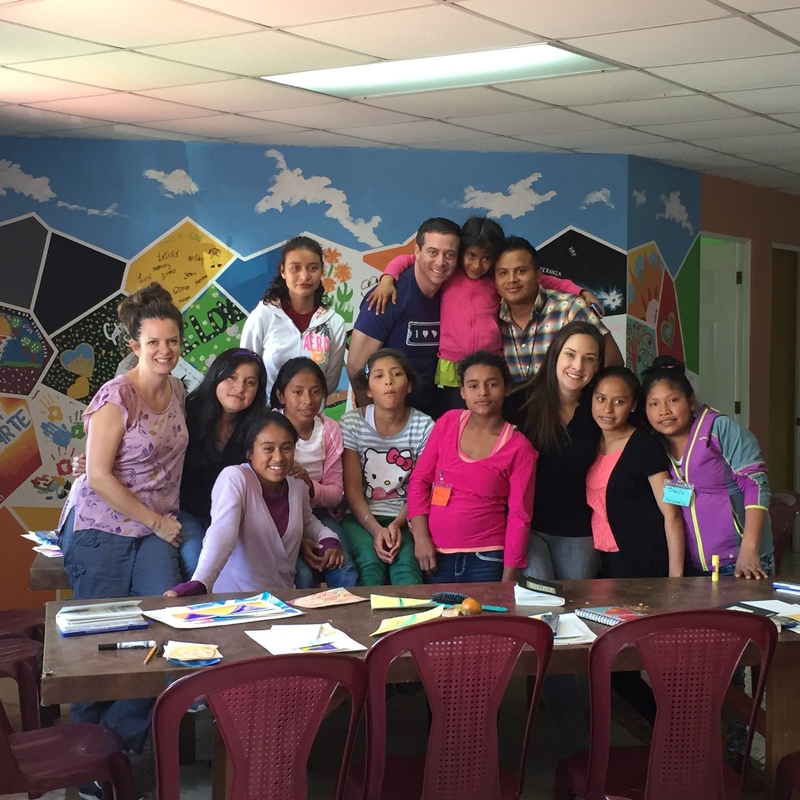 Casa Bernabé (House of Comfort) is an orphanage and Oasis Residential Home takes in girls who have been the victims of sexual abuse. The kids from Casa Bernabé and Oasis Residential Home have been in extremely rough conditions. There’s nothing easy about that. Fortunately, coming from a difficult background isn’t a life sentence. Resilience is the ability to adapt to challenging or threatening circumstances and kids are notoriously resilient. But that doesn’t mean just hoping for the best. Change requires action. Athentikos is helping kids learn how to express themselves and process the world around them through creativity. This isn’t something that will instantly transform Guatemala. Our camps will not reverse the problems that their civil war caused. It’s not going to fix the world. But it will, in a unique and beautiful way, change their individual worlds. I read that proactive orientation is “taking initiative in one’s own life and believing in one’s own effectiveness” (Alvord & Grados, 2005). Immediately I thought, “that’s what Athentikos is doing.” We’re teaching these kids to believe in themselves and to see the possibilities that are available to them. We hear over and over again about how children are the future, so it’s important we treat them well. Their lives have not been easy but they have potential to create beautiful art and tell their stories. If you want to watch Reparando, the incredible documentary I mentioned, you can rent it on the Athentikos website for $2 or purchase it for $10 (https://athentikos.com/reparando/). This documentary solidified my passion for going to Guatemala and it’s well worth it to see how the people of Guatemala are finding their potential in poverty.